A picture of the start of the workshop..
After the workshop I will sort this out more and post the abstract, title, slides of each talk separately. We will discuss post-workshop publication at the workshop. 14:50-15:30 Paper Stevan Tomic, Federico Pecora and Alessandro Saffiotti What normative framework for mixed human-robot societies? Stevan Tomic, Federico Pecora and Alessandro Saffiotti. Position paper: What normative framework for mixed human-robot societies? In addition there will be an introduction to the topic by the organisers, an invited speaker and a discussion session. Much of AI only makes sense within the social systems they are embedded. In the real world, these social systems in their turn are created and maintained by the people and thus their cognitive abilities. Thus cognitive and social processes are highly interdependent – studying one in the absence of the other will mean that significant aspects are missed. In this workshop we want to explore the interactions between cognitive and social aspects of “socio-cognitive systems” – that is where the social and cognitive aspects are studied together. The workshop connects elements of IJCAI/ECAI, AAMAS and ICML. Of course, modelling these systems in terms of Multi-Agent Systems seems intuitive, but also would require special attention to the social concepts in these MAS. The cognitive abilities of the agents should adapt themselves to the social context and development, which connects this area to machine learning in a social context. The topic of the workshop also connects to many general AI themes as appearing at IJCAI/ECAI. The main attraction of this workshop is that the topics are all taken together in the context of socio-cognitive systems and not seen as separate topics to be studied in isolation. Instead of focusing on one side or other of this “coin”, SCS will look at theories and systems that strive to integrate the social and the cognitive into a single framework. The social reality in which SCS operate is very complex and moreover not static, but constantly changing based on human interactions. By understanding cognitive systems in their social setting and social systems in the light of their cognitive foundations, the SCS workshop looks for new understanding of both the cognitive and the social. SCS welcomes high-quality research that goes beyond looking at social aspects of individual cognition or the properties of individuals in social systems and seeks to truly integrate these two layers. We particularly welcome interdisciplinary research, work that seeks to tackle areas that have been ignored before and novel approaches to relating the cognitive and the social. We are agnostic about the kind of approach or tools used, but favour approaches with an identifiable empirical or computational/formal content – both systems constructed for a particular goal in mind and models of observed or theoretical systems. However, the aim is to give new insights – into social science, cognitive science and Artificial Intelligence – merely formalising or implementing a system is not enough. We welcome contributions from a wide range of standpoints as long as this does not involve an effective reduction to only the individual or social levels. Papers will undergo the normal review process and are selected on the basis of quality. However, when choices have to be made we will try to spread the accepted papers over the main themes of the workshop. Interesting ideas are more important in this respect than detailed results on fringe topics. 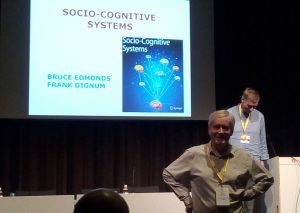 A selection of the best papers of the workshop will be considered for a special issue of the new Springer journal: Socio-Cognitive Systems. We encourage participants to submit a paper (15 pages max), describing their work on one or more of the topics mentioned above. All non-presenting participants will need to submit a one-page position statement which presents their view on socio-cognitive systems relative to (one of) the workshop topics. All submissions must include the author’s name(s), affiliation, complete mailing address, phone number, fax number and email address. Please use the LNCS format for formatting your paper. All accepted submissions and position statements will be published in the workshop proceedings. The deadline for receipt of submissions is 1st May 2018. Papers received after this date will not be reviewed. The workshop will partly follow a traditional format with presented papers. However, we will strive to have group discussions about the papers as well. Part of the day will be devoted to discussing ways to get interdisciplinary collaborations going in this area and finding new research opportunities and applications that combine several aspects of socio-cognitive systems. Bio: Dr. Frank Dignum is working on social aspects of software agents with applications in serious gaming and social simulations. He is well known for his work on norms and agent communication and lately for the combination of agents and games and Agent Based Social Simulations. He has organized many (>10) workshops (ACL, AMEC, COIN, AGS,…) and conferences (AAMAS, ECAI) on the topics and given tutorials at most major conferences and summer schools on them. Bio: Bruce Edmonds is Professor of Social Simulation and Director of the Centre for Policy Modelling at the Manchester Metropolitan University. His reseach focusses on all aspects of agent-based social simulation, having organised many workshops and edicted many special issues on a variety of related topics.